less internal drag and more market advantage. Are you and your team are undergoing a period of transformation? You’ve likely identified a value creation model that drives your strategy and are perhaps renewing your focus on the business core (or exploring alternate business models). Actions are being taken to implement improvements and you may be seeing early evidence that underscores your belief that right the plans are in place. As you move towards embedding a culture of operational excellence and agility, you confirm your balance sheet is positioned to support your strategic ambitions or determine where funding will need to come from. The tough decisions made over the last few years may be beginning to yield some results and you are guardedly optimistic about achieving this year’s targets. 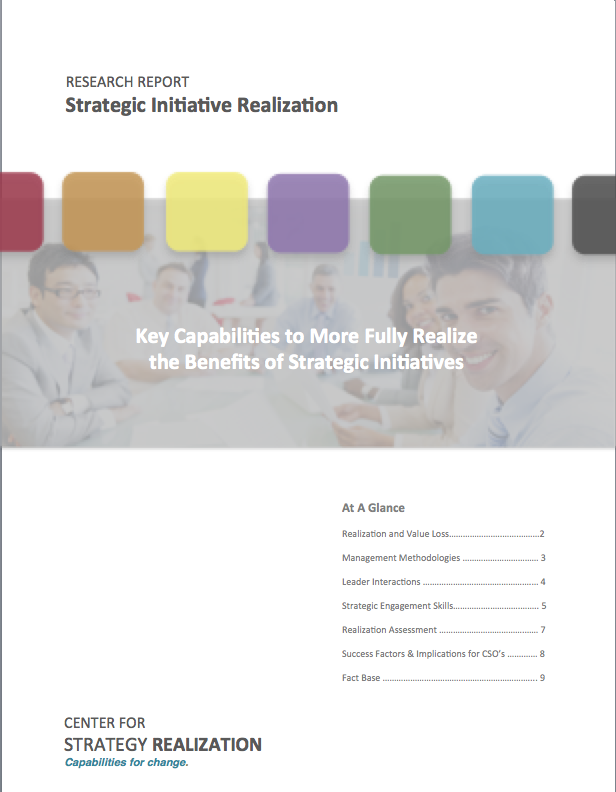 While you are exhilarated about the prospects ahead, you also sense that your organization’s capability to fully realize business results from strategic priorities is not yet reliable enough for you to count on it without question. You can’t quite put your finger on the cause. Something seems to be missing and you are concerned that you could potentially miss some commitments. If this is your experience, the Center can help. We provide the skills and resources to help you build and sustain a high-performance organization that can execute against your most audacious goals. We will partner closely with you to 1) examine all aspects of your execution cycle to understand areas of opportunity, 2) assess your people’s execution skill needs to deliver on current priorities, and 3) assure a consistent and fully integrated approach to building execution capabilities that fully realize business results going forward. 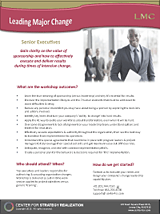 Our Executive Advisory Servies will provide you with clear, direct, and actionable guidance for senior executives and their teams that increases realization of company goals and avoids the pitfalls of large, complex, and high-risk business changes. This includes senior team facilitation and one-one-one advisory support. Increase realization of strategic priorities, customer retention, and profits. Be better prepared to achieve growth while addressing current and emerging market opportunities. Tap into, and benefit from, research on what the world's leading companies are doing to improve the realization of results when faced with an unclear or emerging future. Improve ‘execution acumen’ company-wide by embedding a consistent yet flexible approach. Be confident that your approach to execution adapts to accommodate shifting priorities and a customer-centric business model. We'll support you in building the specialized internal capabilties needed to improve realization of your most important strategic priorities. Gain clarity on the value of execution acumen and how to effectively carry out critical responsibilities.